Hodly Wallet Review - Buy, Sell and Store Cryptos. Scam or Safe? HODLY WALLET REVIEW: BUY, SELL AND STORE CRYPTOCURRENCIES - IS IT A SCAM OR SAFE? Cryptocurrencies have taken the world by storm. In just a few years this revolutionary asset class has obtained a massive market capitalization worth billions of dollars. In the earliest years of the crypto era, it was challenging for the average person to convert fiat currency to crypto, speculate with crypto, and to transact with crypto. Luckily, this isn’t the case anymore and crypto fans are able to exchange fiat currency to crypto in the same time it takes to perform an online credit card transaction. Let’s take a look at Hodly, an easy-to-use crypto wallet with all the features you may be looking for. Hodly was created and is maintained by the same team who built and runs IQ Option, a renowned options, forex, cryptocurrency, and CFD broker. When evaluating a cryptocurrency wallet, an important aspect to consider is whether the team who operates it has the experience and expertise to actually do it properly. The IQ Option team have really proved themselves with the impeccable IQ Option trading platform they built and have also done a pretty decent job with the Hodly cryptocurrency wallet. A major advantage of transacting with Hodly, is that IQ Option, and hence Hodly, are connected to numerous prominent cryptocurrency exchanges around the world. This is a great advantage to Hodly and IQ Option because it promotes effective and competitive pricing of their crypto instruments as well as deep liquidity and good redundancy in terms of access to crypto liquidity providers. When trading IQ Option’s cryptocurrency CFDs, the trader does not actually own any cryptocurrencies. A CFD is merely a contract for difference which is connected to an underlying asset (a cryptocurrency, in this case). The trader gains exposure to the price gains or losses of the crypto but does not actually ever own it. The ease with which Hodly can be accessed is impressive. Not only can users access Hodly by means of the website/browser version but also by using the Hodly app on their mobile devices. This can be really handy because the app has the full functionality of the website version, which makes it convenient to tap into all the benefits Hodly has to offer, even when you’re on the move. 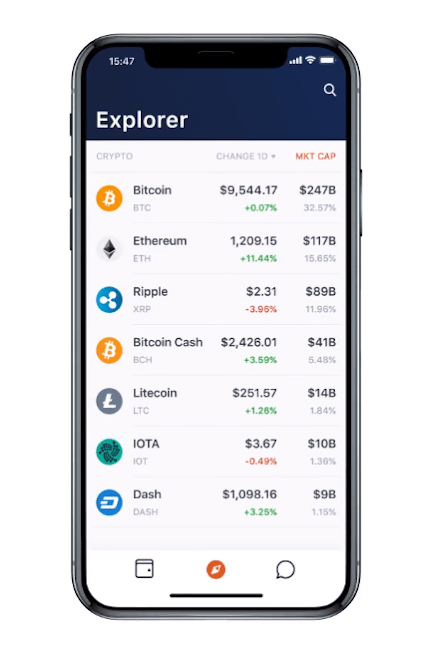 Another obvious benefit of the mobile app is that users can use it to pay for goods and services (with cryptos) without the need of a pc. Clients of IQ Option can directly access a Hodly crypto wallet by simply logging in with their IQ Option username and password, even if they just have an IQ Option demo account. Enter a username and password, accept the T&Cs and click ‘get started’. This takes you into your new crypto wallet interface. Click ‘Buy Crypto’, select the crypto you need and enter your Visa or Mastercard details. Confirm the transaction which delivers the desired quantity of the chosen crypto into your wallet. Do you notice that no account verification is needed up to this point? Well, with a basic ‘unverified’ account, you can buy, sell, and receive cryptos. However, to send crypto or to withdraw funds from your Hodly wallet requires verification. Luckily, the process is really quick and convenient and only requires you to upload an image of your ID! Your details are electronically verified which results in a lightning-fast verification time of about 15 minutes. This is really, really impressive! Using the Hodly wallet is an absolute pleasure. Both the Hodly app and the web version are really user-friendly and straightforward to use. Hodly clients who want to look at different crypto data points like market cap, trading volume for the last 24 hours, the current price, and the one day percentage change, can see all of this in the Hodly wallet itself. There is no need to search for this elsewhere. IMPORTANT CRYPTO MARKET INFORMATION IS DIRECTLY AVAILABLE IN THE HODLY WALLET ITSELF. ON THE MOVE? GET LIVE CRYPTO DATA ON THE HODLY MOBILE APP! 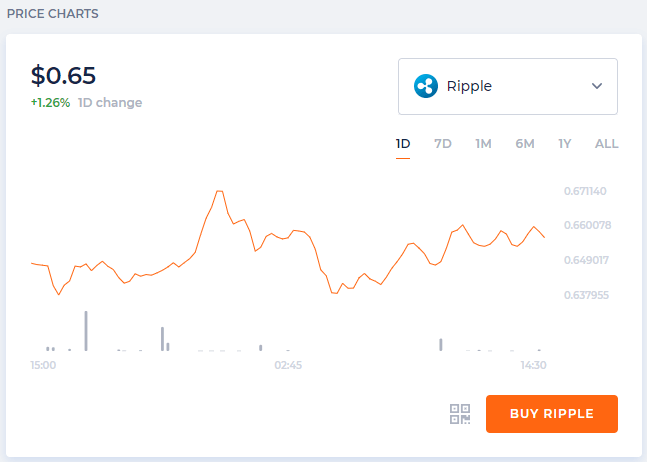 Users who find Hodly’s price charts a little basic can use the charts found on IQ Option’s cryptocurrency exchange. Numerous indicators and graphical tools can be plotted on these charts and different chart types are also available (e.g. candlesticks charts or bar charts). An important difference between Hodly’s crypto wallet and IQ Option’s crypto exchange, is that with Hodly, users are only able to buy the respective cryptos at the current market price, whereas with IQ Option’s crypto exchange, users are able to place limit orders as well as market orders. What is Hodly’s Security Like? Hodly is pretty secure indeed. The vast majority (80%) of the crypto held in Hodly is stored in cold storage. This basically means that it is isolated from the internet which prevents it from being stolen or hacked. Hodly also makes 2-factor authentication available to their clients. This means that in addition to the client entering his username and password, an authentication pin code will be sent to his mobile phone which is also required to complete transactions. Hodly also handles sensitive information responsibly by storing it offline, encrypting it, and distributing copies to several bank vaults around the world. When it comes to credit/debit card payment processing, Hodly ensures safe transactions by means of the SSL (Secure Sockets Layer) protocol they have in place. Hodly’s support team is exceptionally responsive and helpful in handling queries and questions. Dealing with Hodly is really a streamlined and straightforward process overall and the wallet is easy to use and understand. This in itself helps to prevent customer support representatives from being too busy to attend to all queries in a reasonable time. Hodly offers support for hard forks on its cryptos. This is a great benefit because users can hold on to a crypto which is to undergo a hard fork and benefit from that fork. 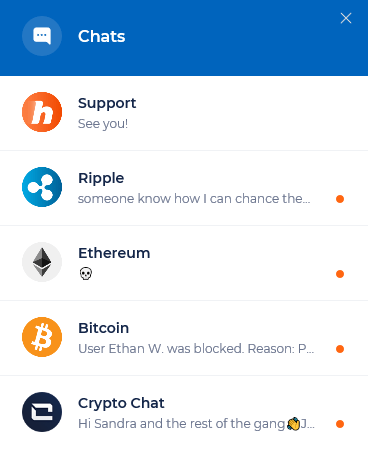 USE THIS CHAT FEATURE TO CONTACT SUPPORT, GENERAL CHATS WITH OTHER USERS, OR COIN-SPECIFIC CONVERSATIONS WITH OTHER USERS. 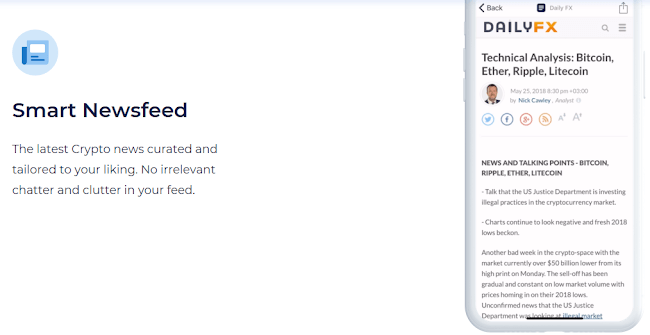 KEEP YOUR FINGER ON THE PULSE OF THE CRYPTO MARKET WITH HODLY’S SUPERB SMART NEWSFEED. In the crypto market, traders and investors need to be aware of important crypto news and announcements. Hodly effectively incorporates this into their mobile app’s Smart Newsfeed! Who Can Not Make Use of Hodly’s Services? Cryptocurrencies are prohibited in certain areas, so Hodly is not available to users from the following countries: France, Ecuador, Bolivia, Iceland, Kyrgyzstan, China, Nepal, Morocco, and Cambodia. Also, Hodly is not available in the following countries: the USA, Russia, Canada, Australia, Belgium, Israel, Palestine, Japan, Sudan, Syria, Iran, and North Korea. Hodly’s fees are really competitive and users can convert their fiat currency to crypto for just 2.5%. The same rate applies when crypto is converted to fiat currency. Until recently, Hodly’s fiat-to-crypto conversion fee was 4.9% which has negatively affected the rating of its mobile app. However, with their current conversion fee of only 2.5%, we expect plenty of 5-star reviews to roll in soon. Users who withdraw cryptocurrencies from Hodly incur a small fee but cryptocurrency deposits are free (excluding the crypto network fee charged to the sender of the crypto). Hodly users enjoy free crypto transfers between each other which is pretty awesome. 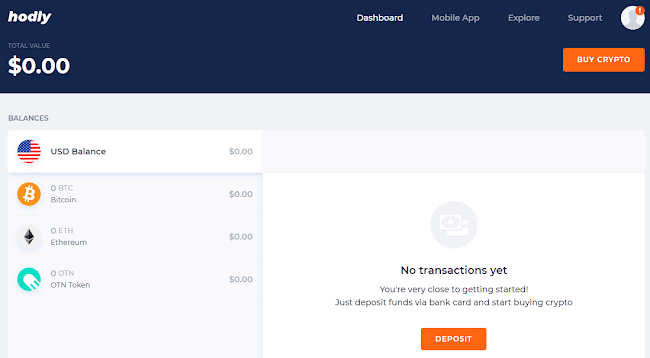 Also, Hodly does not charge clients to deposit or withdraw fiat currency. Of course, users may incur bank charges for using their credit or debit card to deposit or withdraw funds. When depositing fiat currency, users can choose between the U.S. dollar, British pound, euro, or Russian ruble. OTN tokens are the native tokens/digital currency of the Open Trading Network. This network uses smart contract technology to facilitate transactions between two incompatible blockchains. The OTN token is used as an intermediary liquidity token in this process. OTN tokens are distributed as ‘airdrops’ (given away for free) through different channels which include the IQ Option trading platform and gifts to existing OTN holders. 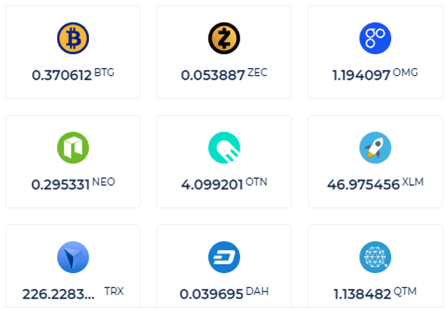 The OTN token is one of the cryptos available in the Hodly crypto wallet and can easily be bought directly with fiat currency. Fiat currency withdrawals from Hodly are usually processed within one business day. Even though the Hodly wallet may not support every single popular crypto out there, it is a really useful gateway to convert fiat currency to cryptocurrency (and vice versa). Parties who need cryptocurrencies which are not supported by Hodly can use Hodly to convert their fiat currency to one of the larger cryptos, which can then be sent to the appropriate wallet or exchange which can convert it to the originally desired crypto. The exact opposite can also be done - first converting a specific cryptocurrency on another exchange, then sending the new crypto to Hodly, and then finally converting it into fiat currency. Hodly’s transparent and easy-to-use interface, which is combined with excellent customer support, security, and other appealing features, make Hodly an outstanding cryptocurrency wallet, to say the least!